The Bay Club at MattapoisettÂ recentlyÂ announced the issuance of a limited number of Off-Season Dining Memberships for the 2010/2011 season. This membershipÂ extends dining privilegesÂ at the Club’s charming Golf House restaurant between October 1, 2010 and May 15, 2011, including specialÂ dining events.Â PreviousÂ dining events hosted by Bay Club Executive Chef Jim Mercer include:Â Palm Beer Dinner, La Cucina Italiana Dinner, Wines of the World Dinner the popular DinnerÂ andÂ a Movie Night Series, and the Julia Child Dinner.Â Â Additionally, members are entitledÂ to take-away menu items,Â as well as the enormously popular option of orderingÂ a home cooked Thanksgiving Dinner. Those who wish to join this programÂ must be sponsored by a current Bay Club member and are charged a flat rate, of which seventy five percentÂ is credited for food and beverage. Details on the Off-Season Dining Membership, including a FAQ sheet and application, can be found by clicking here.Â Or, ifÂ you prefer, please contactÂ Dave AndrewsÂ directly at 508-758-9543. 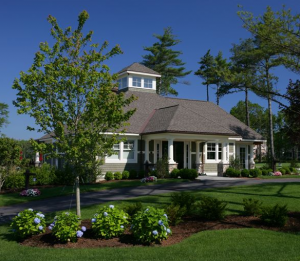 The Bay Club is a golf and country club community with 625 acres of wooded and gently rolling terrain, that includes 200 acres of open space and 175 home-sites in Mattapoisett along the SouthCoast of Massachusetts. To arrange a private tour please contact Dave Andrews via e-mail or phone, 508-758-9543. Bay Club of Mattapoisett Director of Fitness, Dave Maloney, works with members on their golf and fitness conditioning to improve their overall strength and lower their golf scores. 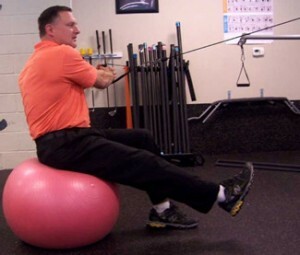 Certified by the Titleist Performance Institute (TPI) Dave offers this exercise to develop core stability and strength. 1. Set the functional trainer arm to be level with your chest height while sitting on a stability ball. 2. Lift one leg off the ground and rotate as far as possible across your body. 3. Perform 2 sets of 15 repetitions with your left leg elevated and repeat with your right leg elevated. 4. You just want enough weight, so that you feel your core is needed to stabilize you on the ball. This Fall the Bay Club at Mattapoisett is exploring healthy lifestyles through the food we eat by offering presentations for the members.Â Dr. Lilian Cheung will be at the club to discuss her new book Savor – A Mindful Approach to Fitness, Eating and Life which she co-authored with Zen Buddhist master, Thich Nhat Hanh. Dr. Cheung is a Public Health professional and will discuss new ways of coping with competing demands on your energy, thoughts, and time as well as new ways to maintain wellness.Â A renowned nutritionist and co-author of various books on nutrition, Dr. Cheung is also the Director of Health Promotion and Communication at the Harvard School of Public Healthâ€™s Department of Nutrition. Also this month, in the Sports and Activities Center at the Bay Club at Mattapoisett, there will be a special viewing of Food, Inc. This documentary film examines corporate farming in the United States, concluding that agribusiness produces food that is unhealthy in a way that is abusive of animals and environmentally harmful. Although difficult at times to watch, it will certainly change the way that you look at food and enlighten you about where our food is really coming from.Â This documentary is a must see film for everyone!